While I'm off gallivanting across the Canadian landscape, I've gathered a few guest posters for your reading enjoyment. Today, I'm incredibly pleased to offer this guest post from JL, a vegan blogger from NYC. I've had the opportunity to get to know JL through Twitter conversations and her blog, and I am excited to share her with you now! Also look for her at Vida Vegan Con in Portland, Oregon this summer! Post-40 JL became a marathoner and triathlete, changed careers and transitioned from vegetarian to vegan. She now writes about vegan cooking (and wine!) and fitness. JL is a community college administrator and teaches nonprofit management at a local university. She holds a B.A. and M.S. and is currently enrolled in an advanced graduate program on Adult Learning. JL lives in metro New York City with her husband and two cats. 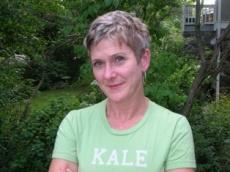 You can find JL at JL goes Vegan: Food & Fitness with a side of Kale and on Twitter and Facebook. Please join me in welcoming JL! Thank you, Geanna, for inviting me to offer a guest post while you enjoy your vacation! 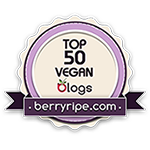 I recently shifted my diet to include higher raw foods –and it’s generated a lot of interest from my fellow vegan food bloggers. I get it. I thought raw diets seemed mysterious and slightly scary when I began reading about them. As a new vegan I was already in unchartered territory – I couldn’t imagine ditching the stove, oven, pressure cooker, crockpot or rice cooker. By eating higher raw, that’s not necessary. Why higher raw? I have written a few posts on why I started eating higher raw and how it’s going, which you can read here, here and here. Recently I came across an article that really resonated with the “why” for me: Enzymes: Catalysts of Digestion. I encourage you to read up on higher raw diets to see if it’s for you. The reason for this post is to offer a few tips to increase your raw foods intake. Eat raw, whole foods (snack on fruit and veggies): Yep, it’s that simple. Just cut up some celery, carrot and pepper sticks to nosh on during the day. Toss a banana and a pear in your bag before leaving for work. You’re eating higher raw! Drink juices with vegetables and fruit: This is one of my favorite ways to get tons of great, raw fruits and vegetables in my diet. Almond milk, spinach, avocado, vanilla protein powder, hemp seeds, ice and coconut water. Kale stems? Think back to when you’ve baked kale chips or made a kale salad. You pulled the leaves off the stem. What do you do with the stems? Save them and juice them! By the way, I do not own an expensive Vitamix or BlendTec. My good ole Breville Compact juicer does the job for me. 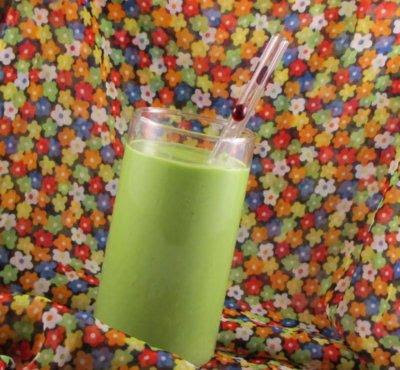 Drink smoothies with blended vegetables and fruit: I have one of these almost every day! Oh yeah, I’ve become a “green monster” convert. I like to use either a frozen banana or an avocado to get a nice, smooth texture for my smoothie. I use spinach, kale or collard leaves for my “green.” Trust me, the taste is lovely and not overwhelmingly green or veggie. It’s best to start with spinach, which is a bit milder. I use a basic Oster blender. Make hearty salads or vegetable leaf wraps with raw nut pates and dressing: These two meals are new staples. Raw nut or seed pate and dressing recipes abound on the internet! Try wrapping up a nut pate in a collard green or Swiss chard leaf or in a (untoasted) nori sheet. 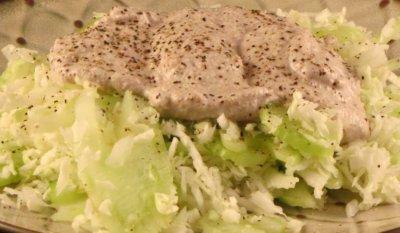 Whip up a nut dressing in the blender and make a hearty salad. Place all ingredients except the water in the blender. Blend, adding water slowly to achieve desired consistency. Serve over raw veggies. Raw ‘til noon: I make a fresh vegetable / fruit juice in the morning for breakfast and take a green smoothie to work in my Blend-N-Go cup for a mid-morning snack. 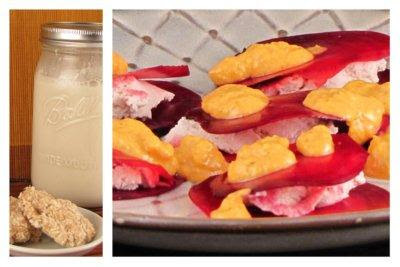 Raw ‘til dinner: Same as above, plus a pate wrap or nutty salad and fruit and raw veggie sticks for afternoon snacks. Raw all day! Same as above, plus a raw dinner and dessert. I’m about 75% raw Monday through Friday and about 50% raw on the weekends. I feel great! I’m sleeping better (and require less sleep), have high energy and am kicking some digestive and skin issues to the curb. Geanna, thank you again for inviting me to share my higher raw adventures with your readers!